Whether you are an avid reader or not, you wouldn’t mind being able to read faster than most others around you can. Wouldn’t you? Trust app makers these days to come up with the most ingenuous ideas and create apps for anything and everything you could possibly think of! We now have apps that could speed up your reading! Boston tech startup Spritz has created this wonderful speed reading app called Spritz over which, with a little bit of practice, you can read at the speed of anywhere from 500 words to a 1000 words per minute. to give you an idea of speed reading, using spritz, you can read an average sized news article in 45 seconds. You can finish an average novel in about two to three hours. 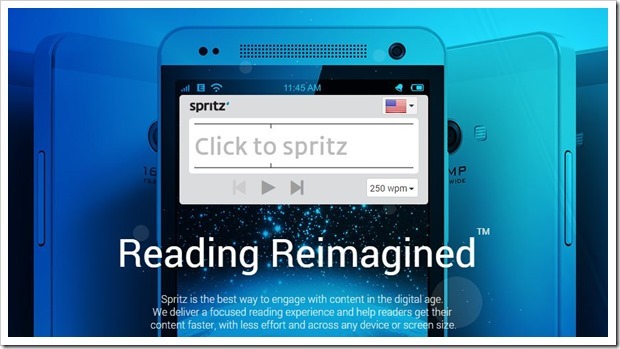 How does Spritz help you read faster? In conventional modes of reading, you move your eyes along the text as you go through it. Based on the premise that you waste a lot of time just moving your eyes, Spritz flashes the text to you at a constant speed (chosen by you) in the same place, without you having to move your eyes from one word to the next as you read on. And if you do not mentally sound each and every word while reading, you can read at a speed much faster than an average human is capable of speaking at. With a little bit of practice, you can actually improve your reading speed greatly- even if you do not manage to get to 1000 words per minute. If you have been using devices like Kindle or reading a lot over your smartphone devices, your eyes will get used to this very soon. The only drawback with this app is that since the words are streamed at you at a constant speed, you cannot choose to ponder over the phrases you need to absorb and savour while just moving over the portions of the text which you might find uninteresting or boring. My speed was 283 words per minute when I first took the test and since I was keen to see how much the app could help me, I took the test repeatedly. I was able to get to 366 words per minute in less than 20 minutes. Now, that is a huge improvement- and not a bad speed at all. The best thing about this app is that you do not ONLY read the text – you comprehend it. Most of us, while trying to read faster, simply read without assimilating the text. The app helps you avoid that. Waldman adds that reading at double your usual speed because of the app does not mean readers will cut down their reading time by half. They will be able to read twice as much in the same amount of time. After reading about Spritz and trying it out, we found out that there are other Spritz like Apps over the Play Store and iTunes which can make reading faster. They include ReadMe!, Sparker, Quickipedia, Rapid Reader and BibleGist. Although some or perhaps all of these apps might help you read faster than you conventionally do, no app can beat Spritz. The good news for all voracious readers like me is that they can now spritz-ify the entire internet from their desktop browser using their bookmarklet called Spritzlet. Readers can spritz all websites they like to visit using Spritzlet. Click here to get the Spritzlet. Wish something like this was available for reading music. No turning pages and no losing your place.